In her article Understanding Trust in e-Government, Sofia Colesca stated, “Governments worldwide have begun to recognize the potential opportunities offered by ICT to fit with citizens’ demands, and have started to introduce information and transactions online in what is now called e-Government.” In a number of states, specifically Alabama, employment services have significantly changed because of advanced ICT. I interviewed David White, program services manager and Peggy Russell, Alabama JobLink manager, to understand better the history. According to White, in the late 1980s the America’s Workforce Technology Solutions (AWTS) was transferred by subscription to states as America’s Workforce System (AWS). AWS was the mainframe system used to perform job service activities in the workforce centers. Individuals would come into the “unemployment office” from 8 a.m. – 5 p.m. to find jobs, said Russell. AWS was staff assisted only; meaning job seekers could not access the system according to White. In order to effectively access the mainframe, the exact command had to be entered otherwise the user would receive an error, said Russell. In the 2000s, AWTS became America’s JobLink Alliance (AJLA). It was being developed to be a Web-based system to replace the mainframe, said White. In 2004, workforce centers underwent funding cuts. According to White, staff (limited staff) could no longer bear the workload of providing staff assistance to jobseekers. The choice to go to AJLA was an economical one, said White. Government could not afford the cost to contract out to an Oracle based system or comparable system with startup costs of $2.5 million. The cost savings for implementing AJLA’s product included no initial cost, reduced annual subscription and lessened overhead from staff and office supply costs. Russell said the efficiency gains are that jobseekers can now search jobs online at anytime, from any location and can use keywords instead of exact commands. The use of keywords greatly reduces the number of errors received and increases job search results, even if the person is not tech savvy. This year celebrates the 10th anniversary of Alabama JobLink (AJL)’s implementation. The ongoing development of AJL is performed by a consortium of workforce agencies across the United States. These agencies collaborate resources to provide efficient and effective public service delivery. Global investment giant T. Rowe Price emphasizes power in numbers, “When people pool their resources, they often have access to more than they would on their own.” Although this speaks in a financial context, combining resources proves beneficial in other areas such as sharing knowledge or best practices, also known as knowledge management. “But knowledge management means more than databases and networks,” it involves mostly institutional matters to create an environment of participation, as stated by Mike Burke in his article Knowledge Management: Everyone Benefits By Sharing Information. Colesca discussed a major issue among citizen adoption of e-government: trust. “The online environment does not allow the natural benefits of face-to-face communications and to directly observe the service provider behavior, assurance mechanisms on which humans have depended on for ages” Colesca said. Thus, affecting the use of e-government by citizens. “ICT can be used efficiently only if it is trusted,” said Colesca. This is where knowledge management steps in. 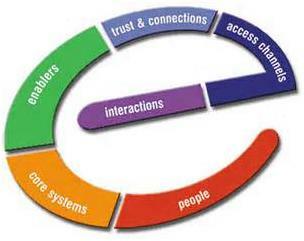 According to Burke, individuals within organizations can “capture and exchange knowledge through communities of practice – professional networks that identify issues, share approaches, and make the results available to others… improved customer service will be a natural outcome.” In this network, public servants can effectively communicate to citizens and reduce the feelings of vulnerability and risk associated with online service delivery.